Treasury Secretary Timothy Geithner asked Congress on Tuesday for broad new powers to regulate nonbank financial companies like troubled insurer American International Group whose collapse could jeopardize the economy. 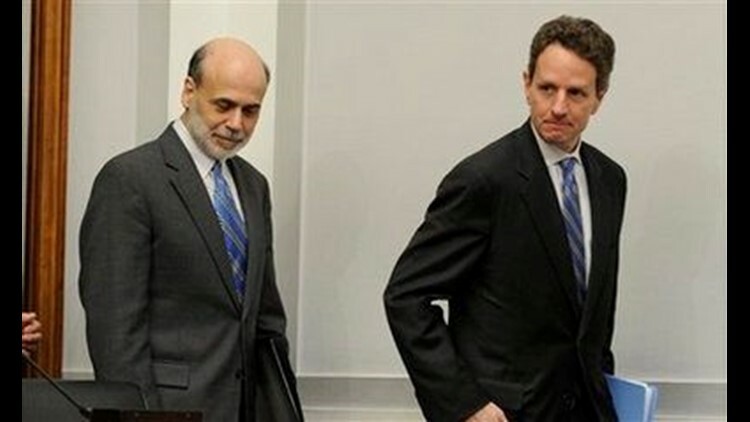 Geithner joined Bernanke in calling for greater governmental authority over complicated and troubled financial companies - power they likened to the authority wielded over banks by the Federal Deposit Insurance Corporation. That includes the power to seize control of institutions, take over their bad loans and other illiquid assets and sell good ones to competitors. AIG is a globally interconnected colossus, with 74 million customers worldwide and operations in more than 130 countries. The government decided it was simply too big to let fail. That delighted Wall Street and the Dow industrials shot up nearly 500 points. On Tuesday, Wall Street gave back some of its gains and the Dow was down just over 45 points in midday trading. Much of Tuesday's discussion centered on ways to help the government better deal with future AIG-like companies whose failure could devastate the financial system and the drag down the economy. "As we have seen with AIG, distress at large, interconnected, non-depository financial institutions can pose systemic risks just as distress at banks can," Geithner said. "The administration proposes legislation to give the U.S. government the same basic set of tools for addressing financial distress at non-banks as it has in the bank context"
Geithner made it clear he believes the treasury secretary should be granted unprecedented power, after consultation with Federal Reserve Board officials, to take control of a major financial institution and run it. The treasury chief is an official of the administration, unlike the FDIC, which is an independent regulatory agency. "Quite differently. It could have been taken into receivership or conservatorship. ...The bonus issue would not have arisen," Bernanke said. He said that contracts providing for the bonuses could have been adjusted and "we could have taken haircuts" against some of AIG's financial obligations to other companies. Geithner has been sharply criticized for his role in the AIG bailout because he helped put the deal together last September as then-president of the New York Fed, yet said he did not learn of the big bonuses until two weeks ago. "You're right, this goes well beyond AIG," said Geithner. Geither was noncommital. Sherman told him he was trying to "hide the ball." Bernanke said it was "highly inappropriate to pay substantial bonuses" to the employees. Bernanke said he asked that the payments be stopped but was told that they were mandated by contracts agreed to before the government seized control of AIG on September 16. "I then asked that suit be filed to prevent the payments," he said. Bernanke said that his legal staff counseled against this action on the grounds that Connecticut law provided for substantial punitive damages in the event any such suit failed. AIG's financial products division has a base in Connecticut. The AIG bonuses created a public relations headache for President Barack Obama at a time when he was trying to gin up public and political support for his economic policies, bank-rescue plan and overhaul of the nation's regulatory structure. Associated Press writer Martin Crutsinger contributed to this report.